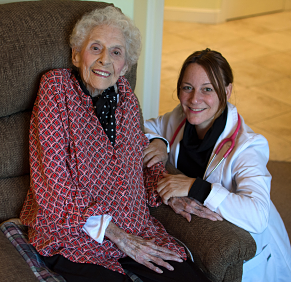 Nurse Practitioner Rachel Prusak with her patient Rita Hjorten. Every one of us has had the experience of caring for someone. You understand the value in being there for a loved one during their time of need, but also how demanding providing that care can be. That is why we are asking for your help. In the coming years, our country will have the largest population of older adults ever, with 10,000+ people turning 65 every day, and no real plan to support them as they age. Much of that responsibility will fall on the 52 million Americans who bear the burden of working full time while spending 20 or more hours a week caring for an aging parent or loved one. Help us to lift some of that weight off their shoulders. Your gift will help someone like Karen, a 65-year-old Housecall Providers patient. Karen uses a wheelchair, has diabetes and receives dialysis three times a week. She has faced numerous hospitalizations and spent considerable time in a skilled rehabilitation facility. Those costly stays drained Karen’s finances, and she is no longer able to afford her assisted living facility. Housecall Providers is a lifeline to Karen, offering primary medical care and social work services to assist her in finding a new place to call home. A gift today will help to ensure that those who need home-based health services will receive the benefit of compassionate physical, emotional and spiritual support when they need it the most. Wishing you and yours a happy holiday season.